The issue of increasing numbers of migrants trying to cross the Channel in small boats to reach the UK has "no easy answers", the home secretary says. Sajid Javid is chairing talks in London later after agreeing a joint action plan with the French interior minister. 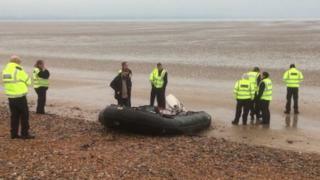 On Monday morning, Border Force officers were called to Greatstone, Kent, after a group of 12 migrants were spotted. Since November, a total of 239 people have reached the UK by boat. Mr Javid has come under growing pressure to act, and has returned from a family holiday in South Africa to address the issue. Following a call with his French counterpart, Christophe Castaner, the pair agreed an "enhanced action plan" to be put in place in the coming week. 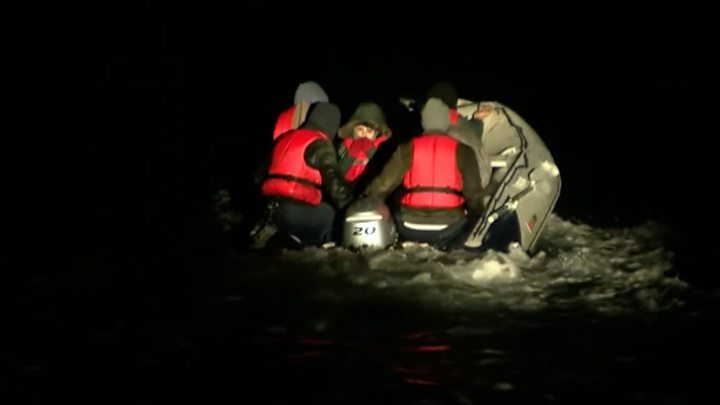 It includes increasing joint patrols and surveillance, disrupting organised trafficking gangs and raising awareness among migrants of the dangers of a Channel crossing. The Home Office did not give information on how this would be done. Some MPs - including Conservative backbenchers - have criticised a lack of detail, as well as calling for more Border Force patrol boats to be deployed. Mr Javid said the complex factors behind the rise in numbers of people attempting the Channel crossing included instability in the Middle East, organised crime and tighter security at Calais. Writing in the Daily Telegraph, he said: "The reasons behind the increased crossings are complicated and in many cases outside of our control." "Unfortunately, this means that there are no easy answers," he wrote. "So our response is focused both here in the UK and abroad." A meeting between Mr Javid, the Border Force, the National Crime Agency (NCA), Whitehall officials and other agencies was held on Monday to discuss what further action could be taken. "While we have obligations to genuine asylum seekers... we will not stand by and allow reckless criminals to take advantage of some of the most vulnerable people in our global society," he added. Currently, only one of the Border Force's fleet of five cutters - specialist boats which the force describes as being capable of rescuing several migrant boats at the same time - is currently operational in the Dover Strait. The prime minister's spokeswoman said the Border Force had increased the number of "smaller and more agile" coastal patrol boats deployed across the south-east coast in recent months. Dover MP Charlie Elphicke has repeated calls for Border Force cutters to be called back from search-and-rescue operations in the Mediterranean to patrol the Channel. The Home Office has not said whether any of them would return. Mr Elphicke welcomed the cooperation between France and the UK but said "it falls short of the kind of joint action and operations needed on the English Channel - specifically for the immediate return to France of people making illegal crossings". The NCA said French authorities prevented a further attempt to cross the Channel on Saturday night. Labour leader Jeremy Corbyn said in a tweet: "We have a duty to reach out the hand of humanity, support and friendship to people who are in danger and seeking a place of safety." Shadow home secretary Diane Abbott accused Mr Javid of exploiting the problem. She told the Guardian: "There's no question that, with Brexit and also with the approach of the meaningful vote in January, people are being whipped up about migration issues, because the government thinks this is the best way of frightening people to vote for their deal." Pierre-Henri Dumont, MP for Calais, told BBC Radio 4's Today programme smugglers were using "the uncertainty of Brexit" to "spread fake news" to migrants, telling them that this was the best time to attempt the crossing. He also called for closer co-operation between France and the UK to "dismantle smugglers' associations". A note on terminology: The BBC uses the term migrant to refer to all people on the move who have yet to complete the legal process of claiming asylum. This group includes people fleeing war-torn countries, who are likely to be granted refugee status, as well as people who are seeking jobs and better lives, who governments are likely to rule are economic migrants.